Home Artificial Intelligence Hewlett Packard Enterprise Plans 5000 Job Cuts, Is Your Tech Job Safe? Hewlett Packard Enterprise Plans 5000 Job Cuts, Is Your Tech Job Safe? Technology was once one of the safest industries to be in. Decades ago, technology wasn’t prone to frequent disruption and job cuts the way it is today. And the most recent proof of that changing scenario is Hewlett Packard Enterprise’s latest plan to cut 5,000 jobs. After briefly looking into things at HPE, let’s explore the job cuts landscape in the tech industry, and how current technologies are constantly threatening to shake up the status quo. In HPE’s case, the 10% workforce cut has a simple reason – stay lean when the competition is tough. And it’s tough, all right. HPE essentially offers four types of services: Advisory and Transformation, Professional, Operational Support and IT Financing and Investment. It offers three customer solutions: Hybrid IT with Cloud, Mobile & IoT and IT for Data & Analytics. Hardware products generate most of the money, but their revenue showed a deep decline of 13 percent in the second quarter that ended on April 30. Now that they’ve sold their consulting and outsourcing services division and have penned a deal to sell their software unit, hardware is pretty much their bread and butter. 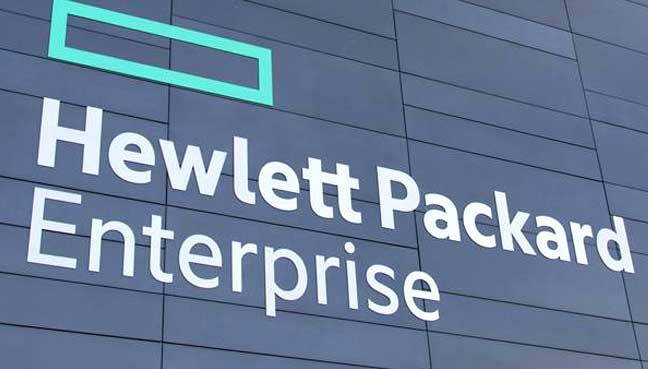 HPE has several deals to strengthen its enterprise group business, and that contributes about 60% of their overall revenue. In Q3 2017, HPE saw a revenue recovery of sorts, gaining 3% year over year in net revenue, which came in at $8.2 billion against the prior-period net revenue of $8 billion. But despite the quasi-recovery in Q3, there’s a problem here that’s not going to go away that fast – the growth of cloud computing. As more and more companies gravitate towards the flexible cloud environment, the demand for server and storage hardware products is extremely soft in the current market. What’s more, cloud adoption is nowhere near its peak, with estimates putting CAGR through 2020 at roughly 17%. With the big cloud service providers like Amazon, Microsoft, IBM, Google and Oracle sitting pretty atop the cloud computing industry, companies like HPE are holding on to their legacy businesses by a thread that’s wearing thinner by the quarter. The problem is more complicated than that, but the explanation above gives you a snapshot of the issue at hand. Competition is high and revenue growth is under attack, so expenses have to be cut one way or another to improve profitability. And the easiest way to do that is through manpower reduction. To be clear, we’re not talking about employee turnover here – that’s mostly voluntary, or people quitting for positions in other companies. That’s an entirely different metric. What we’re looking for are trends in workforce cuts; in other words, involuntary turnover. Let’s look the tech industry as a whole and see if the job cuts trend is really as bad as people make it out to be – or whether it’s a natural part of the industry itself. 2016 was a terrible year for technology industry employees, or so it seemed. In early 2016, analyst Trip Chowdhry of Global Equities Research predicted as many as 330,000 job losses in the tech industry’s top companies. The reality wasn’t quite that horrible: it was only a little more than 96,000 tech employees. However, with tech job cuts surging by 21% last year, the technology industry – comprising computer, electronics and telecommunications companies – accounted for 18% of the United States’ total of 526,915 job cuts. Of these, computer companies were the worst hit. Dell Technologies’ merger with EMC Corporation led to thousands of job cuts; Intel shed about 11% of its personnel, or 12,000 positions; other companies like Microsoft, IBM and Cisco fared only slightly better. The new technologies they’re referring to is primarily a shift to cloud computing, and the disruption that this is causing within the IT industry. But it also includes segments like the Internet of Things (IoT), intelligent analytics, AI automation, autonomous vehicle technology and much more. In certain cases, companies are disrupting their own legacy products, as with Microsoft replacing the Microsoft Office standalone licensing model with the cloud-served Office 365 subscription model. We’re sitting right in the middle of technology disruption from Artificial Intelligence, Smartphone dominance, self-driving cars, electric vehicles, IoT, big data analytics and so many other emergent technologies. That has to have some effect on the mix of the tech workforce. When specialty areas undergo major shifts, this is inevitable. In addition, tech jobs in other industries grew by 2 percent. It implies that, although there is a major shift in job requirements, overall hiring rates are exceeding job cuts. That should be good news, unless you’re one of the tens of thousands of tech employees that lost their jobs in 2016, or waiting for the axe to fall this year. What’s the Real Cause of Job Cuts In Tech? There’s no doubt that the economy itself is growing. 10% of new hires in the country coming from the tech industry is a good thing. The problem here is not one of the nation’s economy, as the evidence bears out. It is one of shifting technologies requiring new skills. And don’t be lulled into thinking that the disruption is over, be any means. Multiple technologies are now attacking the status quo, which means multiple disruption cycles have begun to play out across the technology landscape. And it is affecting not only technology companies, but various industries that depend on technology as their backbone. As you can see from the last table above, the tech industry hasn’t been that bad in 2016 and 2017, historically speaking. 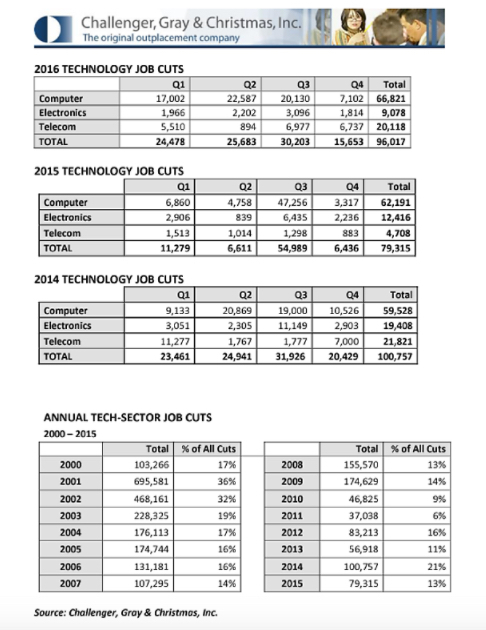 We’re nowhere near the levels of tech job cuts seen during the 2001/2002 periods. Also, if you look at the first three tables, you’ll notice that the third quarter is usually the worst period for layoffs. Thankfully, we’re already at the end of the third quarter of 2017. Which means things are bound to improve over the rest of the year. But why is Q3 the time when companies cut the most jobs? It could be coincidence, but three years in a row is a little more than simple coincidence. One plausible reason is that Q3 is when large, public companies are at the half-way point, and it’s time to reckon their personnel requirements and make painful cuts that will reflect positively on the balance sheet over the next two quarters. Brutally speaking, it’s about management pleasing investors with their dexterity at handling the HR scalpel to cut out the pound of flesh that isn’t useful to the company any more. Another reason is that this is the time right before the holiday quarter, when workloads are generally lower than during the rest of the year. That certainly makes sense, and April is technically the start of the second quarter. That means new hires are done primarily in Q2 (there are exceptions, of course, especially for skilled positions that require previous experience), while job cuts are announced in the subsequent quarter, or Q3. Now for the all-important question that this article is really about: Is your tech job safe? There’s no simple answer to this question. One indication of job security is whether or not your job profile exclusively pertains to a technology segment that is currently being disrupted. If the answer is yes, then you’re possibly on the brink of losing your job in the near future. That’s the worst case scenario, and something you should definitely be ready to face. What Can I Do to Keep My Job – Or Find Another One? Fortunately, there are things that you can do to prevent this from happening. It’s called skills enhancement. Find a skill that you don’t have – but one that your company needs – and acquire it. Many companies have programs for their employees to upgrade their skills to more relevant ones, especially in the realm of technology, so make use of such programs. Even if they don’t have such a program, it’s worth paying for it yourself. Alternatively, you could look for jobs that your current skills qualify you for, but in another company. Don’t wait until the last moment, because the best time to attend a job interview is when you already have a job, not after you’ve lost your old one. The whole technology industry is highly conducive to disruption. If you’re in a niche segment, the going depends on whether that niche is growing or being disrupted. Even if it’s growing, you have to realize that at some point this niche is going to have its turn at being disrupted. It’s a never-ending cycle, and the sooner you realize that the better for your career and future. Things might be different if you’re in senior management, because that’s about handling people, strategies and business units, rather than being about handling specific technologies. Yes, you will have to keep abreast of developments within your company’s industry and the technologies that it encompasses, but your job is probably a lot more secure than if you were lower down the corporate ladder. I’ll say it again: even if you’re in a niche like cloud security, where demand is growing at a rapid rate, don’t be lulled into thinking that your job is safe. Disruption could happen at any time, and no technology is immune to it. Some technologies are more resilient than others, but most will be disrupted at some point during their life cycle. At the end of the day, any technology is only as good as the demand it enjoys in the market, and the market is far from compassionate. No job is safe, least of all a tech job. Always keep learning and upgrading your skills; you never know when it could save your career, because job cuts are inherently a part of the tech industry. The only way forward is forward. Keep moving, keep learning and keep your eyes and ears wide open to the trends that are shaping up around you. This is your career we’re talking about.